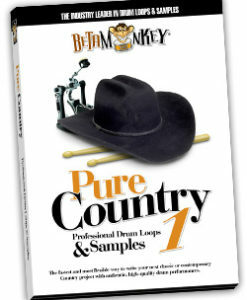 This swinging collection of brush drum loops was recorded in one of Nashville’s most popular drum rooms and is the follow-up to Pure Country III and Pure Country IV. Pure Country V: Nashville Shuffles™ captures authentic swinging brushwork in a 100% live loop pack ready to download. With a focus on shuffles and other swing feels, you’ll develop new drum tracks quickly and easily with a live, natural drum mix from one of Nashville’s best recording studios. Artists who write traditional folk music, bluegrass, rockabilly and honky-tonk will find the right drum parts here, without questions. But, Pure Country V is versatile enough, however, for any songwriter needing the true artistry of a seasoned Nashville drummer laying down the subtle and infectious swing of live brushes. There is no substitute for the real thing, especially when it comes to brushes. 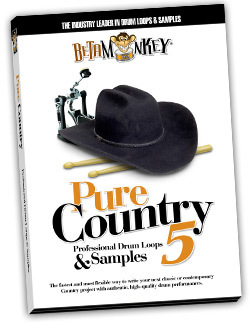 If you need brush drum loops that shuffle and swing, then put Pure Country V: Swinging Nashville Brushes™ will deliver the real thing. True Nashville sounds and drumming ready for your next songwriting project. Authentic Country Brush Grooves: We went straight to the heart of Country music in one of Nashville’s premier drum rooms. Add a seasoned pro behind the kit, with both the playing skills and knowledge of the genre and you have the absolute authority on brushed country drum loops. 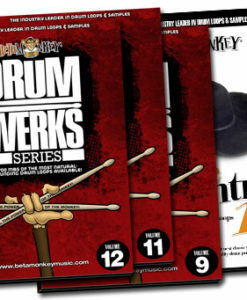 Versatile and Musical Grooves: Over 350 brush drum loops, covering common country swing feels, including brushed ballads, mid-tempo swings, up-tempo double-time shuffles, and more. If your music needs brushes and it needs to swing, Pure Country V has it covered. Complete Song Elements : Count-ins, main grooves, groove variations, fills, intros and endings – all the parts you need for songwriting are included. A complete songwriter package. Have many sample discs will have the drummer count you in?! We have given you all the pieces you need to write your next hit. 357 (460 MB for 24 bit; 307 MB for 16 bit) original, license-free country brush drum loops. 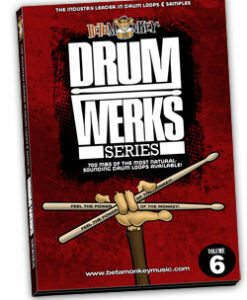 96 (52 MB for 24 bit; 35.1 MB for 16 Bit) multi-velocity drum, snare, and cymbal samples. ALL ACIDized WAV, APPLE, and REX2 formats included in download and for hard copy DVD purchases. Excellent selection of loops and samples. I immediately imported these into my drum tracks and was able to sketch out the drums for some song ideas I had. Thank you! Got these for my guitarist husband for the holidays. He has been using them every since and said they were the perfect gift. Whenever he gets time, I see him playing along to these drum tracks. Nothing but great communication and response from the company as well. Thank you! So nice to find some live brush loops that are musical! Thank you for putting together this collection of loops. These are some great drum tracks. The brushes are definitely swinging and have given me a bunch of new songwriting ideas.